Where to go for our silver wedding anniversary? A beach holiday perhaps? Possibly a city break or even a cruise? They were all considered and discounted. How about spending the night in an ancient church? That sounded more like it. The perfect, quirky way to celebrate our special day. No heating, no lighting, no running water, no conventional toilet. Instead old oak pews, stained glass windows, war memorials, effigies, tranquility, peace, spirituality and a sense of closeness to history (and, for those of faith, God). The Churches Conservation Trust offer this unique opportunity. It’s called Champing. The 2017 season runs from 31 March to 30 September. They have 12 participating churches, dotted in beautiful locations countrywide. We’ve never been to Shropshire. Chris’ ancestors were from that county. So we plumped for St Andrew’s, Wroxeter. 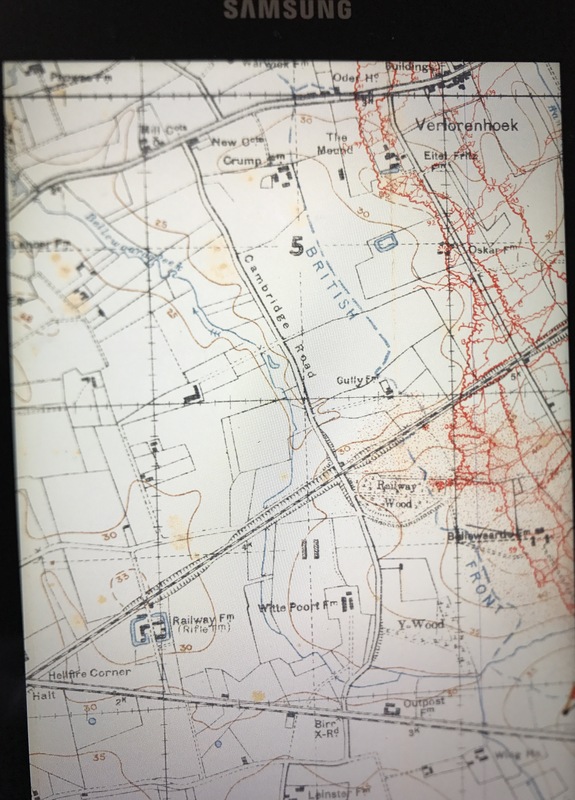 No ancestral connections there so far, but near enough to places associated with Chris’ history. We even met up with some of Chris’relatives for the first time ever on our visit, and it was wonderful to delve into the Haynes family history and shared family characteristics. 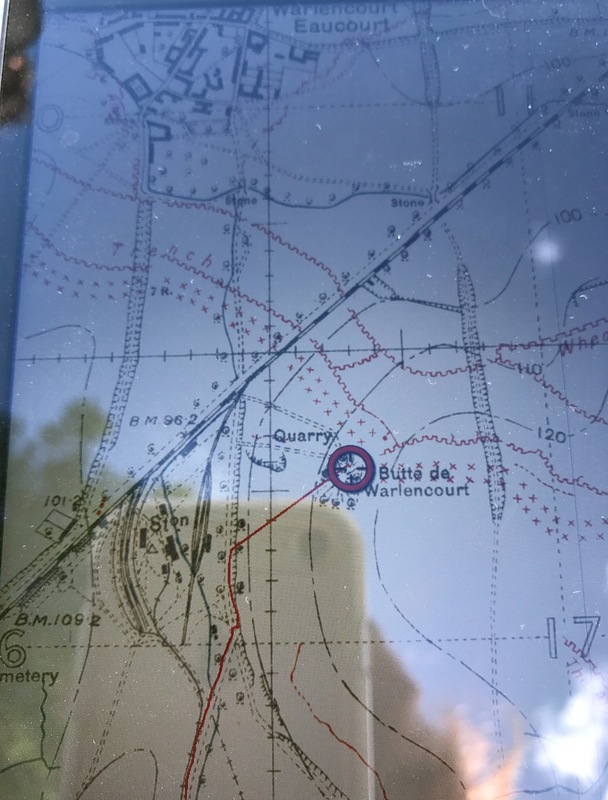 Note to self – I must progress my Shropshire research! Back to our Champing experience though. On 9 May, the morning of our anniversary, Chris, Snowflake (yes, well-behaved dogs are allowed) and I loaded up the car and set off on our adventure. What greeted us was a stunningly characterful church, and everything waiting ready for our arrival. Well almost everything, but more of that later. Parts of St Andrew’s pre-date the Domesday Book of 1086. It also stands on the site of Britain’s fourth largest Roman town. In its heydey Viroconium, as it was known, was almost as big as Pompeii, a place we visited on our honeymoon. 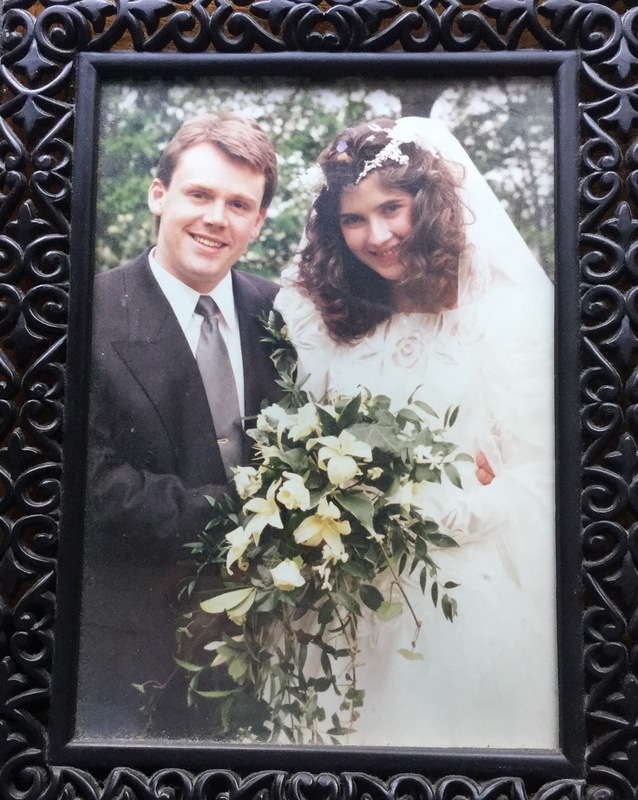 It provided a link with our wedding all those years ago. 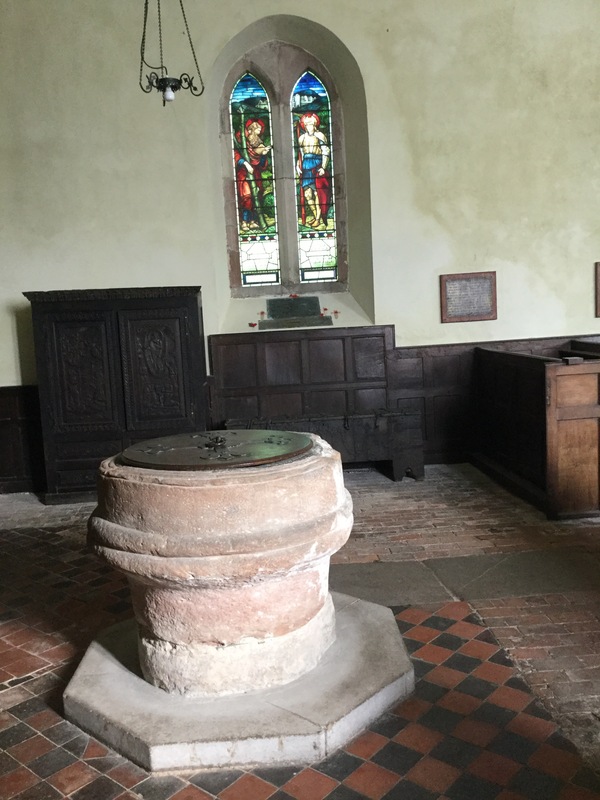 In fact parts of the church include Roman masonry, including the base of the baptismal font. So a very early form of recycling. What’s left of Viroconium is a five minute walk away from the church, and cared for by English Heritage. The remains are not extensive, certainly not on the scale of Pompeii. 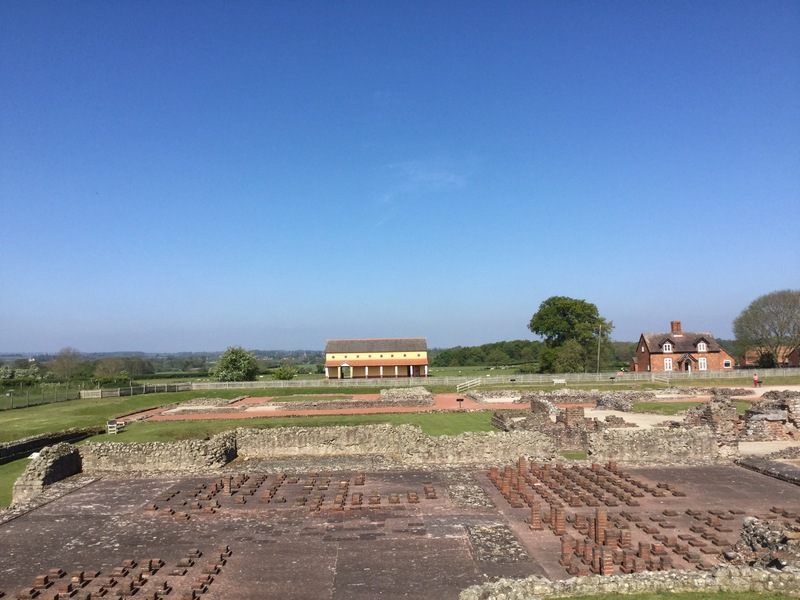 But Wroxeter Roman City, as it is known, is worth a visit. The weather was positively Italian when we went, with cloudless blue skies and warm sun. Other nearby locations included Attingham Park (National Trust) with a deer park and lots of wonderful walks for Snowflake; and to the Roman theme once more, we even had a vineyard on our doorstep. 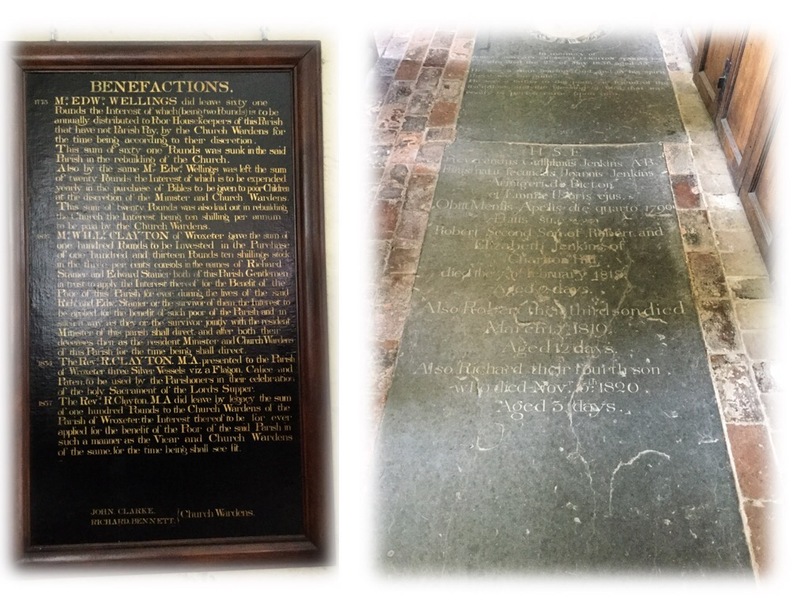 To the ledger stones on the floor, the earliest dating from 1684, to the various wall plaques, the earliest commemorating the 1627 death of Thomas Alcock founder of Wroxeter Grammar School; to the benefactions board recording gifts made to the church from 1773-1837, to the War Memorial commemorating those parishioners whose lives were cut short in the service of their country in the two World Wars. 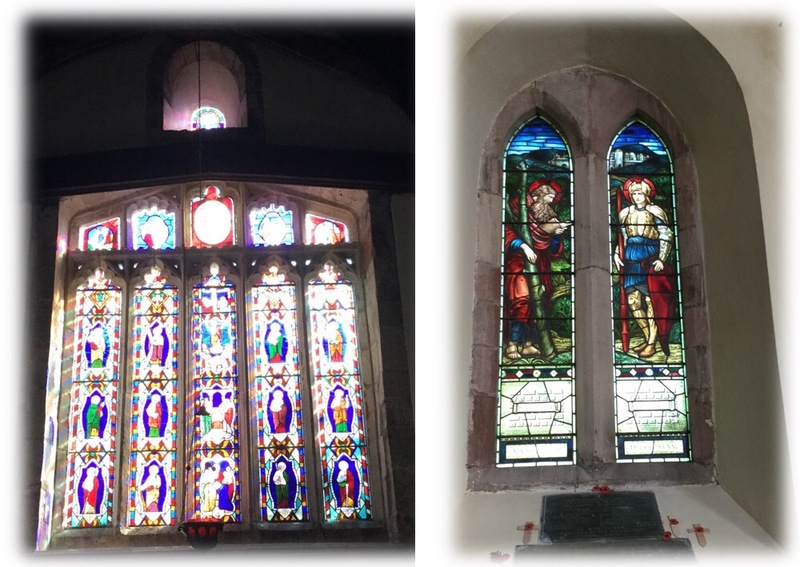 Above all you could not fail to notice the glorious stained glass windows, with others containing 15th century glass fragments, as well as the impressive Elizabethan and Jacobean panelling of the choir stalls, pulpit and pews. It is a beautiful church, absolutely no doubt. 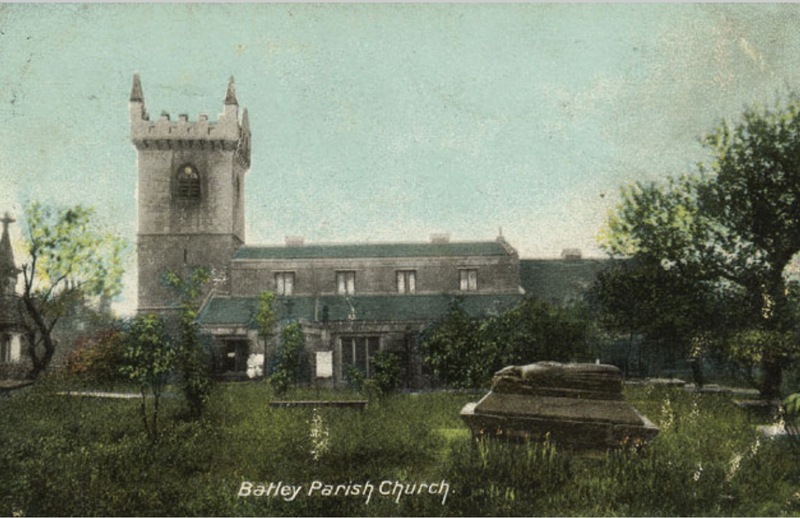 The church was so redolent with echoes of the past I could imagine the parishioners sitting in those solid oak seats. 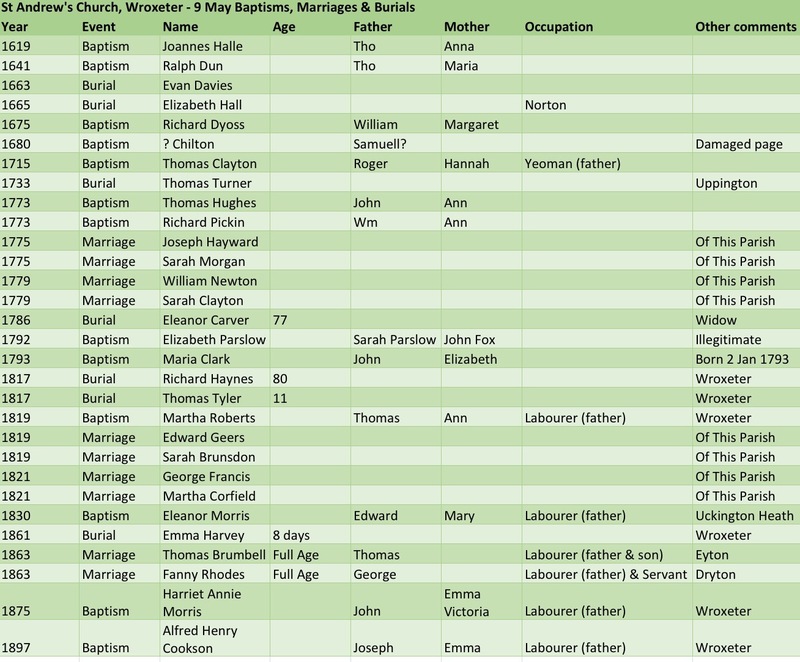 So much so that I compiled a list from the Parish Register (digitised on FindMyPast) of those baptisms, marriages and burials which took place on the anniversary of our anniversary, 9 May, over the centuries. St Andrew’s closed in 1980 and its care passed to The Churches Conservation Trust in 1987. 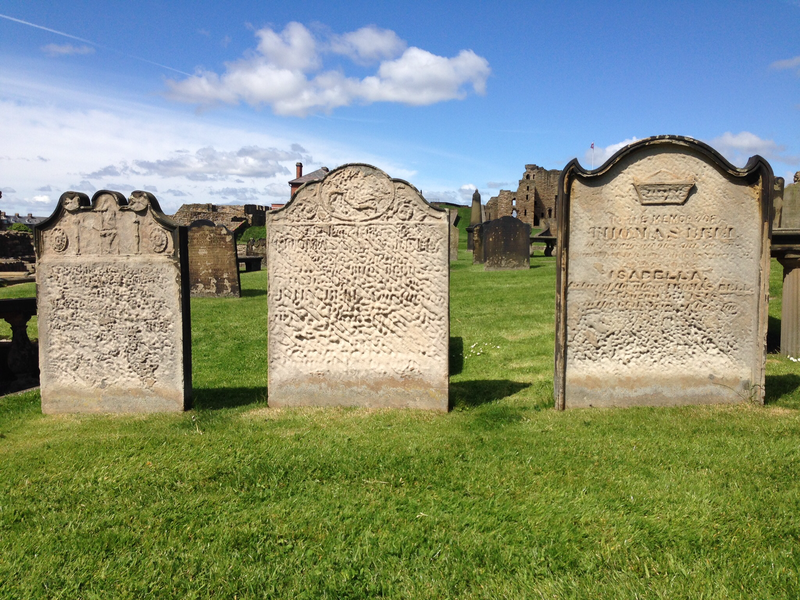 More information about this historic church can be found on their website, with a downloadable leaflet detailing its rich history. So what are the Champing basics? 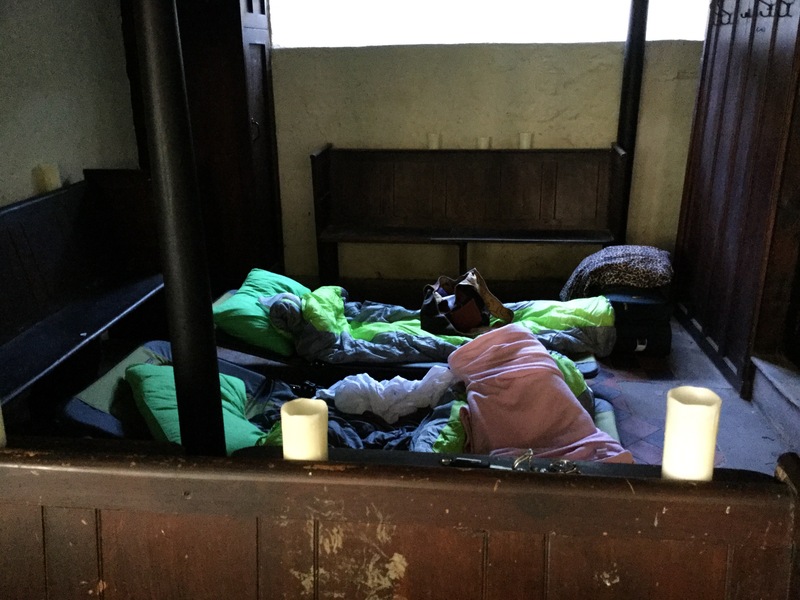 We booked camp beds and sleeping bags, so they were all set up under the organ loft by the time we got there. But you can bring your own. Chairs were provided too. The church is very cold – it’s an old, unheated, cavernous space, so plenty of warm layers are a must. As for illumination, we relied on battery-operated candles and lanterns (supplied), supplemented by torches when the sun set. There was lighting but I forgot to mention it to Chris. Funnily enough to he failed to question why the church had light bulbs. Oops! There is no running water, so forget your make-up, as you can’t wash it off. But we had tea and coffee making facilities and an Aquaid water cooler. 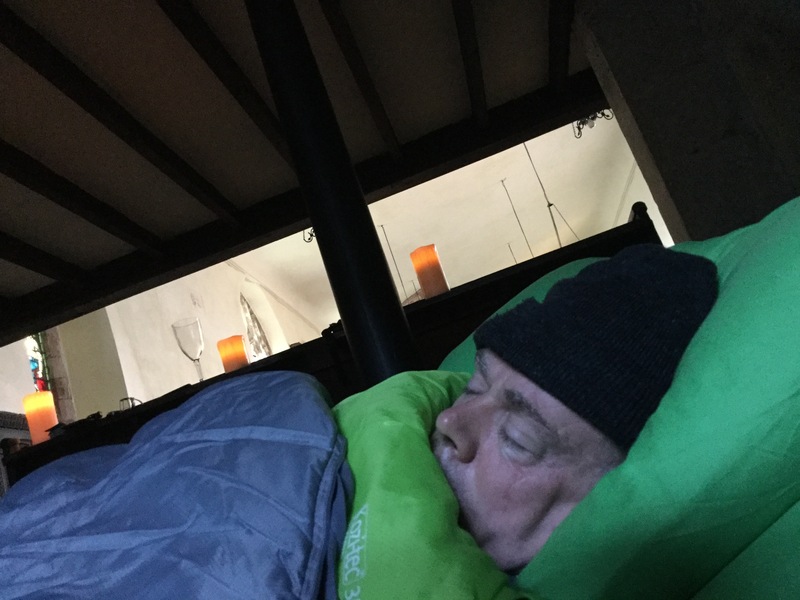 We also pre-ordered a continental breakfast which we collected from the neighbouring hotel upon arrival – no need to worry about a fridge….brrrrrr. We had our picnic hamper too stocked with goodies from Apley Farm Shop, so no danger of hunger pangs. The one glitch, I pre-ordered a bottle of champagne (yes alcohol is allowed). A lengthy game of church “hunt the champagne bottle” ensued, otherwise known as “Champers seeking champers“. We even checked to see if we had to collect from the hotel. All to no avail. We couldn’t check with the Champing team, as the phone lines shut at 4pm (my phone was operating at this stage). So Chris drove to the outskirts of Shrewsbury to purchase a celebratory bottle. 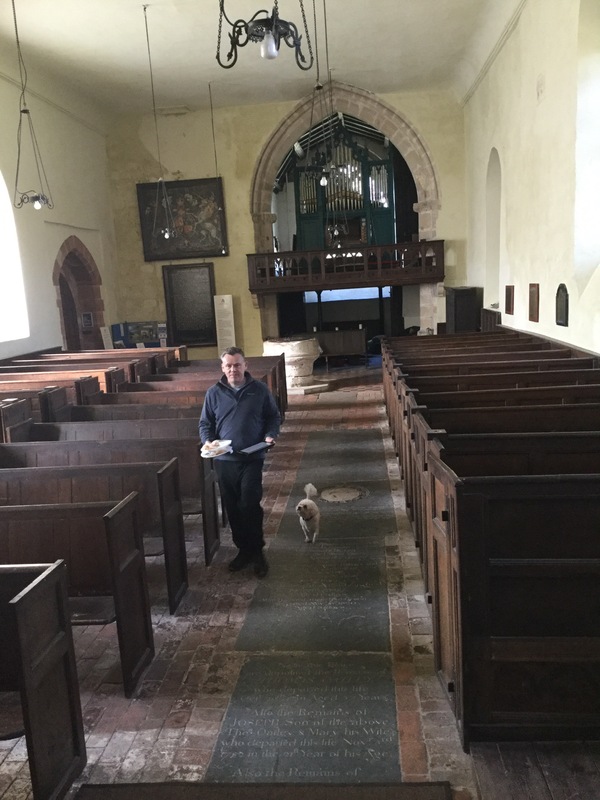 No major drama, in fact it meant we investigated the church more fully; and the Champing team have been fantastic in resolving the issue since our return home. St Andrew’s was all ours between 6pm-10am. In the intervening period it was open to visitors. One very bemused couple did turn up at 6pm – we hadn’t got round to locking the door. They were very confused to see us preparing to take up residence. Perhaps we were squatters? Or had we bought the church to convert to a house, and lived there during the renovation work? They had never heard of Champing, and were fascinated to have stumbled upon a pair of aged Champers. They even joined us on our champagne hunt. So all a bit of a laugh. And as for the very basics, a dry toilet was in the vestry. So all equipped and survivable for even less adventurous souls for one night. It was actually a very peaceful, comfortable and cosy night. Envelopped in my thermals, onesie, dressing gown and slanket as well as the sleeping bag I was extremely toasty! Chris, resplendent in woolly hat, had an equally restful night. These are consecrated churches, and some may find it a tad difficult to get their heads round the concept of hiring these sacred buildings out for what essentially are short holidays. But I think you need to break out beyond that mindset. I am religious attending weekly mass in my Catholic Church so I understand the religious sensibilities. But these ancient parishes and old churches go way beyond the religious element. They were integral components of the community; they were secular, as well as religious, units of administration; they were part of the daily life fabric of our ancestors. 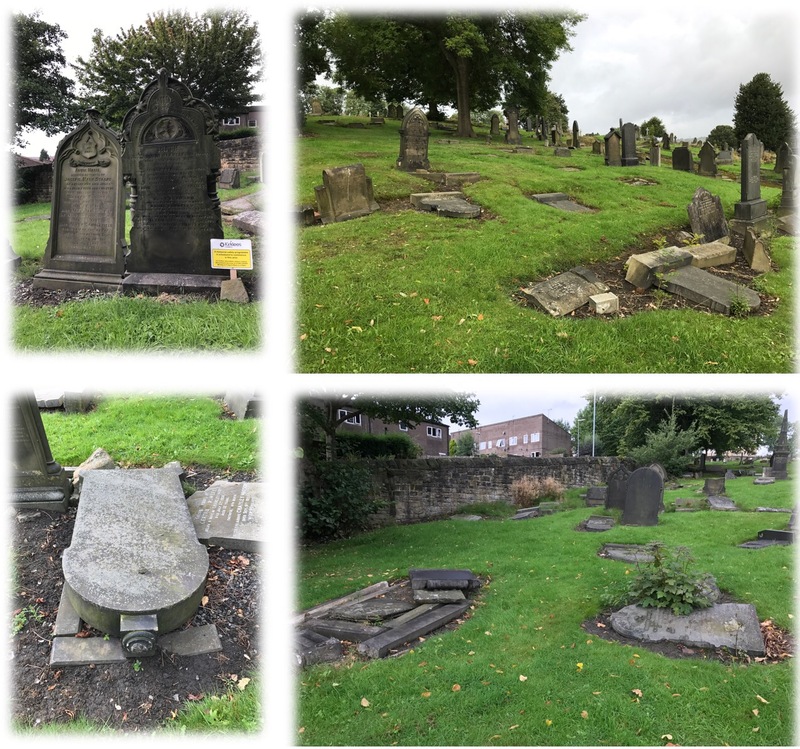 What would become of these churches, no longer used as regular places of worship through demographic movement, population shifts, and changes in religious practices? Yes they could be retained as places to visit, and The Churches Conservation Trust facilitate this. But would you also end up with many others being converted into houses, original features removed, and lost to the wider community forever as a result? I believe Champing is an inspired way of preserving and generating interest in Britain’s rich heritage. It’s a totally different way to connect to history. 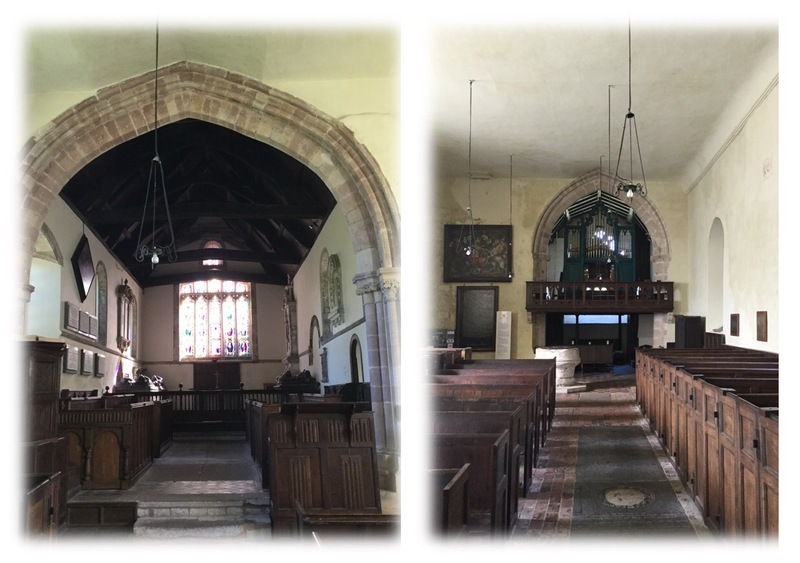 It certainly made me look into the history of St Andrew’s, including all the architectural, fabric and furnishing aspects, which is something I never considered previously when going into a church. 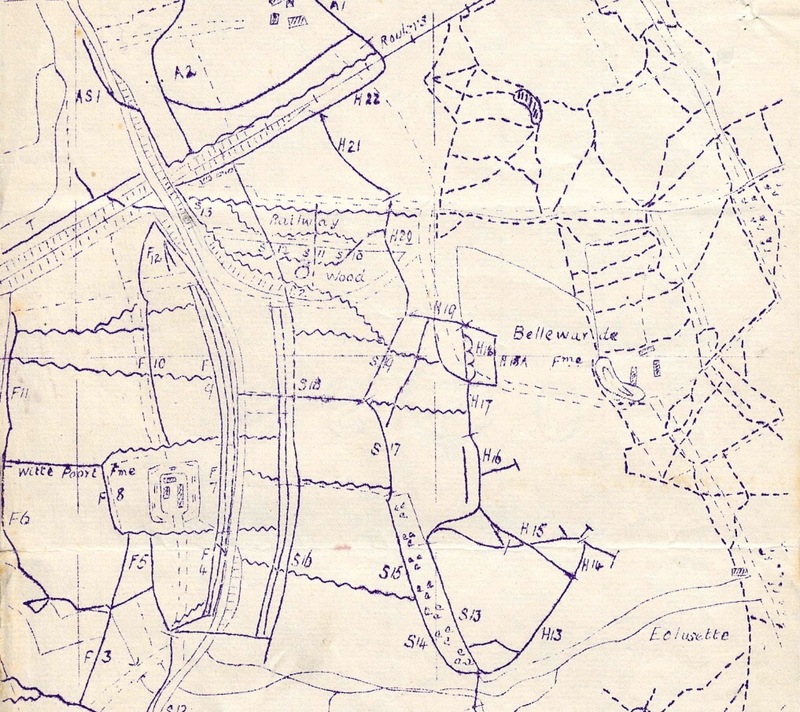 There could also be a potential link-up with local Family History Societies and Ancestral Tourism opportunities (this could equally embrace non-Champing churches too). On a practical level the venture also generates much needed money to help conserve church heritage. It means people are in the building overnight at various points in the year, providing a measure of security. And the churches are being loved, appreciated, used and introduced to a whole new generation. If your locality has a Champing church, it is something to be welcomed, embraced and promoted. 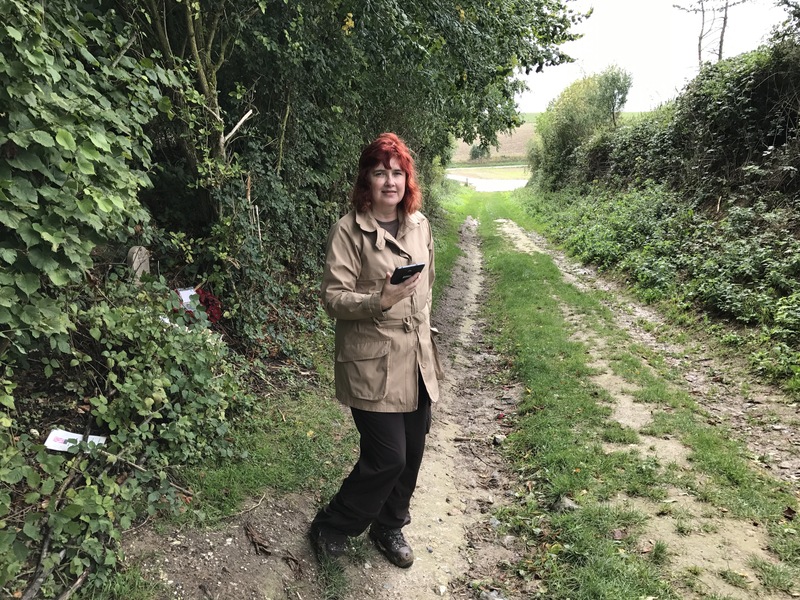 For those contemplating a holiday with a difference, if you’ve a love of archaeology, history and family history, and want a totally different experience in a wonderful tranquil setting which simply oozes the atmosphere of centuries of tradition, I can certainly recommend Champing. Would we do it again? In a heartbeat. More information about this unique experience can be found here.